By the time you will finish reading this article, a person must have died somewhere in India due to reckless driving and ignoring safety precautions. Statistically, more than 500,000 accidents happen every year, resulting in 150,000 deaths: Every 3.5 minutes, a person is dying because of a cause which can be controlled and improved. Yesterday we had shared that popular cars such as Maruti Swift, Alto 800, the Hyundai i10, the Ford Figo, the Volkswagen Polo, Datsun Go and the Tata Nano have failed the car crash tests conducted as per the UN standards of road safety measures. Just for numbers, 18.4% of all road accidents in India last year involved 4-wheelers. Government has taken note of this carelessness by automobile companies, and has taken a decision which will positively impact the road safety drive in India: Every car sold in India will have to include basic safety measures such as airbags, anti-lock braking system (ABS), child restraint systems, seat belt reminders and reinforced body structures. Infact, Government will set up India’s first vehicle safety standard: the India New Car Assessment Programme (NCAP), based on the United Nations NCAP which monitors and checks safety standards implemented by global automobile companies. Once this standard has been implemented, car manufacturers will be required to comply with global road safety conventions, which are so conveniently ignored for lowering down prices. For example, Indian manufacturers will be required to realign the car’s structure and shape as per European standards, which will help the car to absorb the impact after a collision; As per the standards mentioned by the UN, the car should be able to pass frontal and side car crash test at 56 km/hr speed. As of now, Indian cars are designed to withstand car crash at 46 km/hr. As per insiders in automobile industry, due to the implementation of these road safety rules as per the directives of India New Car Assessment Programme (NCAP), every car will be expensive by Rs 30,000 – Rs 35,000. Compared to the cost of losing lives, this increment in car prices seem trivial to say the least. We hope and demand that Government enforce these rules in the strictest of manner, and ensure that Indian roads are safe for all. 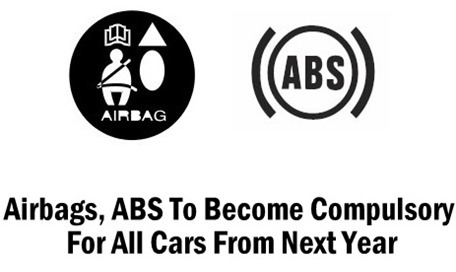 "Airbags, ABS To Become Compulsory For All Cars From Next Year", 5 out of 5 based on 2 ratings. Tata’s First Electric Car, Tigor Rolls Out; 100% Electric Cars In India Very Soon! Tesla Model 3 May Not Come to India in 2017; Local Sourcing Norms Create Roadblock! Finally, a government that cares….. It is very easy for government to force companies to comply. But will government comply to similar international road safety standers; with respect to the quality of roads. We should engineer our roads in such a way that accidents cannot happen.